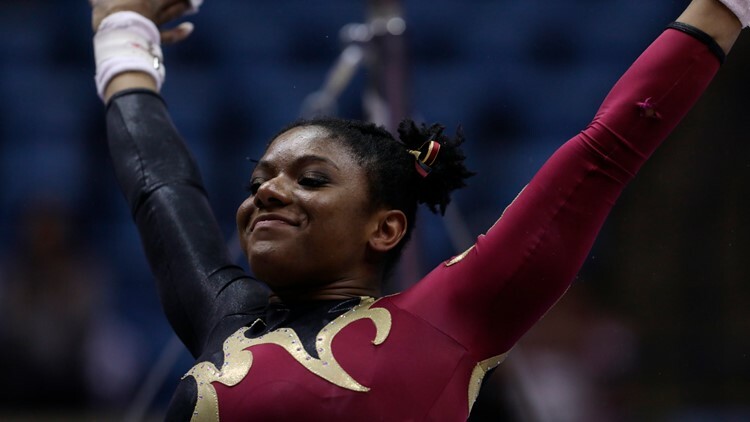 The University of Denver Pioneers gymnastics team had an almost perfect night against the No. 1 Oklahoma Sooners. Sunday afternoon, the No. 7 Denver gymnastics team scored their fourth-highest score in program history against No. 1 Oklahoma in front of a record-setting crowd at the University of Denver's Magness Arena. In front of 6,100 cheering fans, shattering their former attendance record of 4,634 from January 14, 2018, sophomore Lynnzee Brown scored her first perfect 10.0 on floor. It was Denver's first perfect score since junior Maddie Karr nailed a flawless vault on February 18, 2017 and the first perfect floor routine since Nina McGee on March 4th, 2016. "It's super exciting to do what I've been practicing," Brown said. "I wanted to scream (after sticking my final pass)." "I planned out my routine to be right in front of my teammate, and their eye contact kept me motivated throughout the performance. It's a reminder that I'm doing this for them and not for myself," Brown said. Despite a competition filled with mostly positives, the meet outcome was bittersweet for the Pioneers falling just short of the No. 1 ranked Oklahoma Sooners 197.700 to 197.400, only three tenths behind.